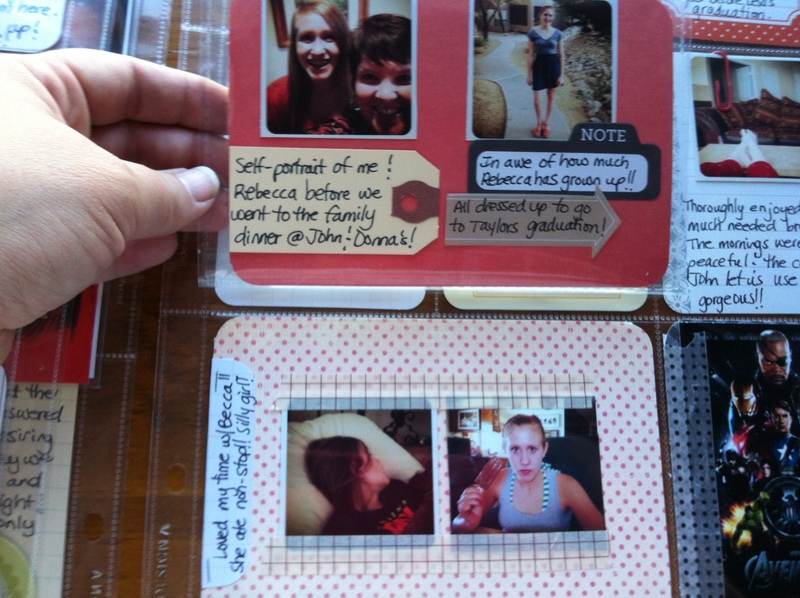 Project Life: Week 21 | I am JuJu! 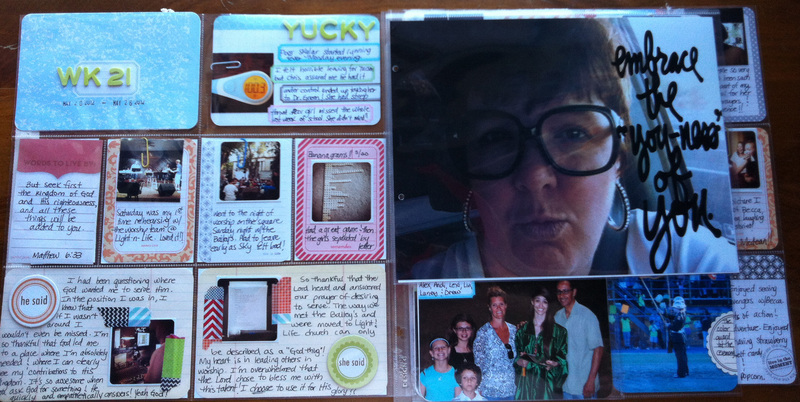 Glad to be back today sharing my project life pages with you! This week I’m sharing week 21 which was the girls’ last week of school as well as the week I went to Tucson to see my 2 cousins graduate from high school. I took so many pictures from my trip and I wanted to include most of them so I ended up having not only my usual spread, but an 8.5×11 insert with 2 enlargements as well as a Design G page protector that spotlighted the individual graduation ceremonies I attended. Here is a shot of the left page and my 1st photo enlargement. I used a digital overlay from Ali Edwards. It says: embrace the “you’ness” of you! I took the picture of me in the glasses after I put them on and realized both lenses had fallen out. In the picture I’m doing my best Austin Powers impersonation! On the backside is another enlargement of 3 of my cousins and my niece together at the graduation. I loved this picture of these 4 beautiful girls and wanted to remember it! I added the words “hello memory” that came from this set also by Ali. 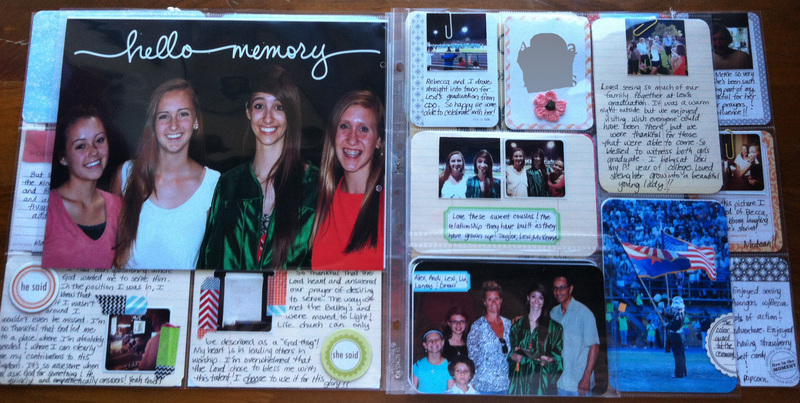 The right side is a Design G protector that covers my cousin, Lexi’s graduation. I also included a flip-up protector on the bottom of the page protector. The beige blob is there because I added her full name to my page and I didn’t want to post that on the internet. I did the same thing on the backside of the page as well. The back side of the Design G insert covers my cousin, Taylor’s graduation. My pictures are pretty dark so they didn’t photograph well. The lighting was not great in the church. It was an absolutely beautiful graduation ceremony!! The right side includes the rest of my pictures from my visit. I used a couple of my new flair buttons from Finding Nana’s etsy shop! Love her shop & absolutely LOVE her project life pages! 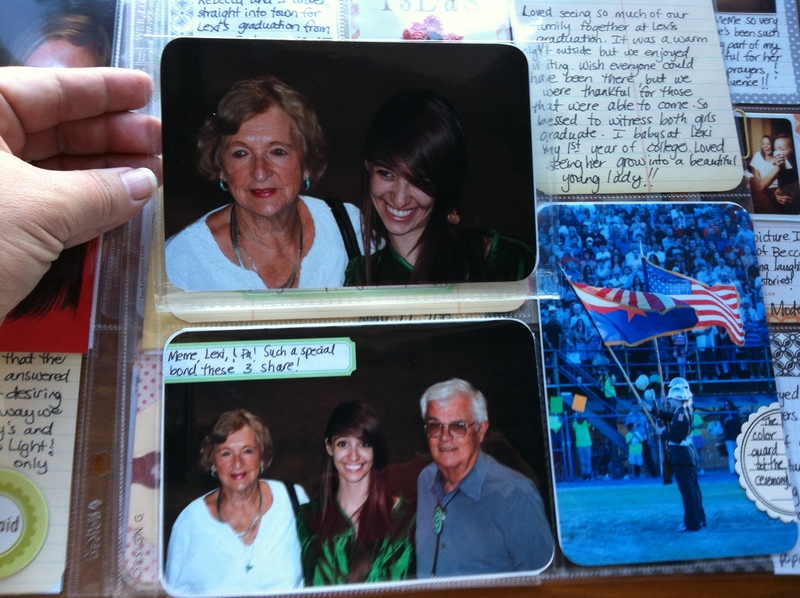 I used another flip-up protector at the bottom of this page. LOVE these silly pictures of my dad and my niece. They ate eegee’s (slushies) and big blizzards about an hour apart. They were STUFFED afterwards. Well, that is it! If you are still reading…kudos to you!! This week had a lot more pages and inserts than I normally use, but I’m so glad that I included everything. I’m linking up with The Mom Creative! Head over and check out all the other wonderful project life posts. This entry was tagged project life, project life week 21. Bookmark the permalink. Great pages! 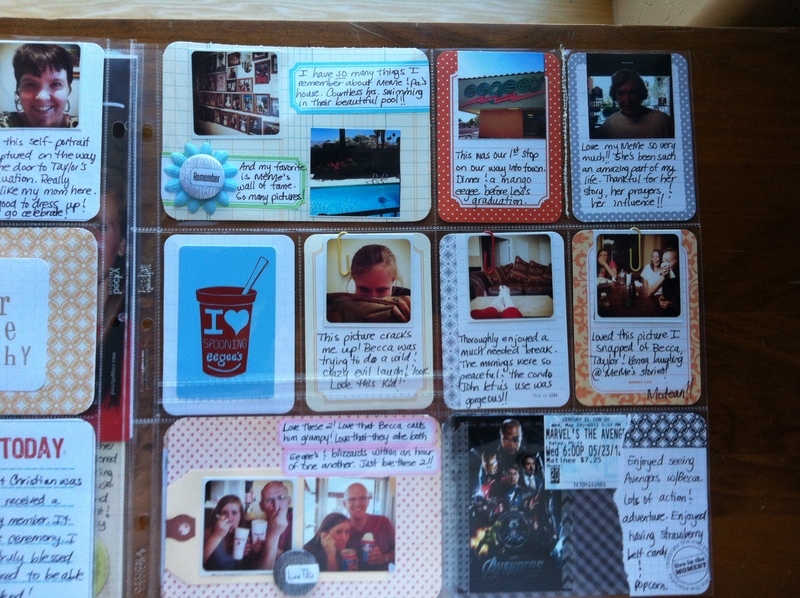 Love the photo enlargements AND how you implemented the smaller Instagram photos! 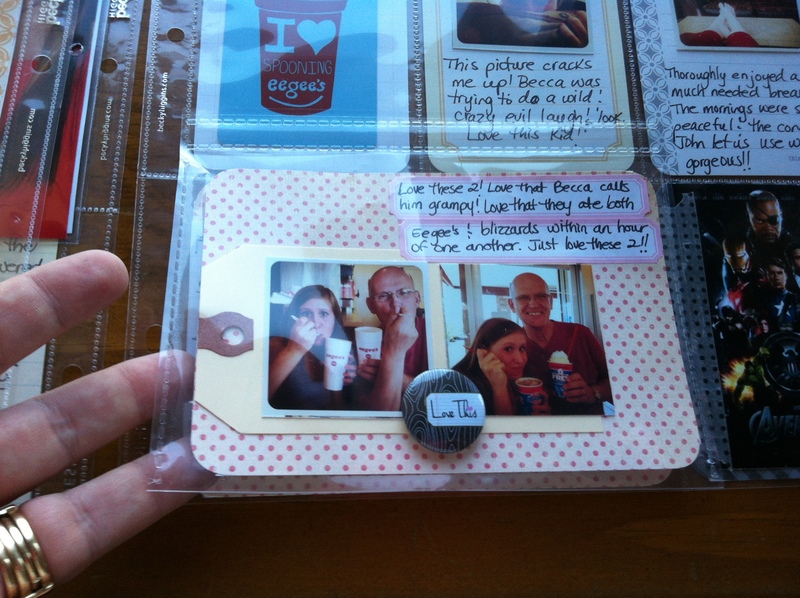 Love the card with tags/instagrams! Sounds like a jam packed visit with a lot to do and memories made. Isn’t it nice how you already did something with them? I love how PL keeps us up to date and our photos off the hard drive and into a project. And that photo without lens cracks me up! Great job on your project life Julie. I just finished week 20. Trying to get caught up.